The Fo Guang Shan emblem, by all FGS affiliated branch temples and organizations. The standing Buddha represents the 36 metres (118 feet) high statue of Amitabha Buddha on the monastery grounds. 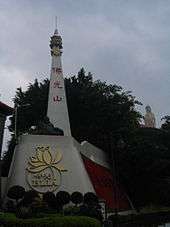 Fo Guang Shan (Chinese: 佛光山; pinyin: Fóguāngshān; Pe̍h-ōe-jī: Hu̍t-kong-san; literally: "Buddha's Light Mountain") is an international Chinese Buddhist new religious movement based in Taiwan. The headquarters of Fo Guang Shan, located in Dashu District, Kaohsiung, is the largest Buddhist monastery in Taiwan. The organization is also one of the largest charity organizations in Taiwan. The order also calls itself the International Buddhist Progress Society. Founded in 1967 by Hsing Yun, the order promotes Humanistic Buddhism. Hsing Yun's stated position within Fo Guang Shan is that it is an "amalgam of all Eight Schools of Chinese Buddhism" (八宗兼弘), including Chan. 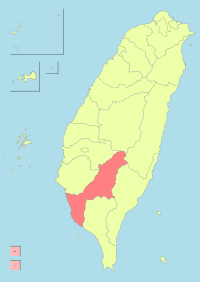 In Taiwan, it is popularly referred to as one of the "Four Heavenly Kings" or four major Buddhist organizations of Taiwanese Buddhism, along with Dharma Drum Mountain, Tzu Chi, and Chung Tai Shan. Main hall of the monastery. At the end of 2000, President Chen Shui-bian of the Republic of China and government officials from Kaohsiung visited Fo Guang Shan bringing with them the wish from their constituents that Fo Guang Shan reopen its mountain gate. After due consideration, Fo Guang Shan decided to reopen the monastery to some extent, thereby providing the public a place to practice Pure Land Buddhism. Building plans for the Buddha Memorial Center started immediately, with support from the Taiwanese government. The site is situated immediately adjacent to the main monastery and covers more than 100 hectares. The complex faces east and is built along a central axial line. Beyond the Welcoming Hall are eight Chinese-styled pagodas on either side of the main avenue leading up to the Bodhi Square, about which are statues of the Buddha's main disciples and of the founders of the principal schools of Chinese Buddhism. This gives onto the Memorial Hall, with its various shrines, including the Jade Buddha Shrine in which the tooth relic is located. Above the hall are four stupas that symbolize the Four Noble Truths. Standing behind but separate from it, there is an enormous seated metal Amitabha Buddha 108 meters high. The Center was opened at an international ceremony on 25 December 2011 and the first anniversary celebrated on Christmas Day 2012. Main entrance to the Fo Guang Shan monastery. Seen also is the BLIA logo, a statue of Maitreya, and the statue of Amitabha in far right. Temples and organizations have been established in 173 countries throughout the world, and now encompasses more than 3,500 monastics. The organisation emphasizes education and service, maintaining universities, Buddhist colleges, libraries, publishing houses, translation centres, Buddhist art galleries, teahouses, and mobile medical clinics. It has also established a children's room, retirement home, high school and television station. The social and medical programs of Fo Guang Shan include a free medical clinic with mobile units that serve remote villages, an annual winter relief program organized to distribute warm clothing and food supplies to the needy, a children's and seniors' home, wildlife conservation areas to protect living creatures, and a cemetery for the care of the deceased. The educational programs of Fo Guang Shan include four Buddhist colleges, three regular colleges, and various community colleges. The Fo Guang University was established in 2000. It focuses mainly on the humanities and social sciences. The Chinese Buddhist research institute is subdivided into four separate departments; a women's and men's college, and an international and English Buddhist studies department. Tuition fees and lodging are provided by Fo Guang Shan, free of charge. The organisation also operates Pu-Men High School in Taipei, Jiun Tou Elementary and Junior High School, Humanities Primary and Junior High School, which provides regular curriculum for students. Fo Guang Shan also has nursery schools, kindergartens, and Sunday schools for children. In 1972, Hsing Yun established a nine-member council, known as the Fo Guang Shan Religious Affairs Committee. These nine members govern the monastery and the order. The members are elected prior to the resignation, death, or the ending of a term of an abbot. Once elected by members of Fo Guang Shan, the votes are openly counted. The nine members then nominate their next abbot. Eight members of the council are ordained monastics, and one is a layperson. 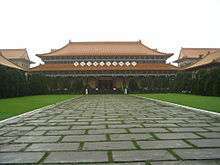 Unlike a traditional Buddhist monastery abbot, where the incumbent selects his successor, Fo Guang Shan directly elects an abbot to head the Order and its worldwide temples. The abbot of Fo Guang Shan is the overall head of the order, the supreme abbot of all Fo Guang Shan temples, and is the chairperson of the RAC, serving a term of six years, with one reappointment by popular vote and under exceptional circumstances, a second reappointment by two thirds of the popular vote. The abbot is elected by all members of Fo Guang Shan through public vote. The abbot-elect then begins to use their "inner name", in place of his/her own dharma name, with the first character being Hsin ("心", xin, or heart). In fact, all monastics of Fo Guang Shan have such a name, and several Elders also use theirs publicly. At the beginning of the year, the abbot-elect is inaugurated as the new director of Fo Guang Shan through a dharma transmission ceremony, receiving the robe and bowl. 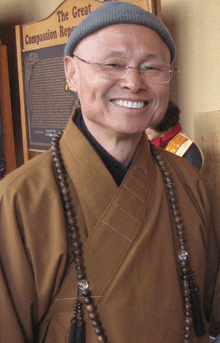 Hsing Yun is the only abbot to have served as such for more than two terms, and was not elected by the RAC. In the case of Venerable Hsin Ping (who was originally Venerable Zhizong), he was also not officially elected, as he was Hsing Yun's designated heir apparent. After Hsin Ping died, the vice director of Fo Guang Shan, Hsin Ting (originally Venerable Zhidu), was immediately elevated to serve the remaining years of Hsin Ping's term. Abbots have been elected according to FGS's constitution since then. As with Hsing Yun, former abbots do not leave the order when they retire. 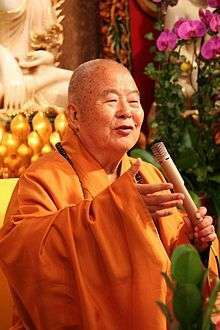 They continue to make Dharma talks throughout the world and become head teachers of the order in their later years. May the Buddha's Light shine upon the ten directions. May the Dharma stream continuously flow towards the five great continents. May we undertake the Great Vows with humility and gratitude." ↑ "Come to Taiwan,Return with good memories". Info.taiwan.net.tw. Retrieved 2012-02-15. ↑ "FGS Singapore". Fo Guang Shan (Singapore) & Buddha's Light Association (Singapore). Retrieved 22 December 2014. ↑ "FGS Singapore". Retrieved 22 December 2014. Note: Although Hanyu Pinyin is the national standard, Tongyong Pinyin and older romanization is still commonly used in Kaohsiung.